Food Allergy or Food Intolerance: What’s Wrong with My Dog’s Tummy? We all know a “garbage-gut” dog — one that will eat just about anything, whether that thing is intended to be eaten or not. If you’re lucky enough to have a canine companion who lacks a discerning palate, you know it can sometimes be tough to distinguish a little upset stomach from a potential allergic reaction to food. Just like people, dogs can react negatively to certain foods or food ingredients. 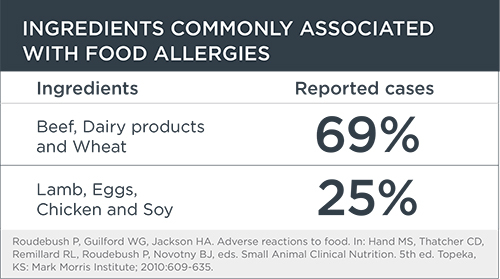 These adverse food reactions — the phrase many veterinary nutritionists now prefer — may be the result of dietary indiscretion, food allergy or food intolerance. Dietary indiscretion (eating something inappropriate) and food intolerance can be abnormal reactions to normal foods or normal reactions to abnormal foods. For example, vomiting and diarrhea after eating moldy chicken found in the trash can could be considered normal reactions to an abnormal food. The dog’s immune system is not involved in causing vomiting and diarrhea. A food allergy, in contrast, is an abnormal reaction to a normal food that results when a dog’s immune system misjudges a safe substance and responds like the body is under attack by a disease-causing invader. Another way to look at it: A food allergy occurs because your dog’s immune system is flawed. It isn’t caused by a problem with the food itself. 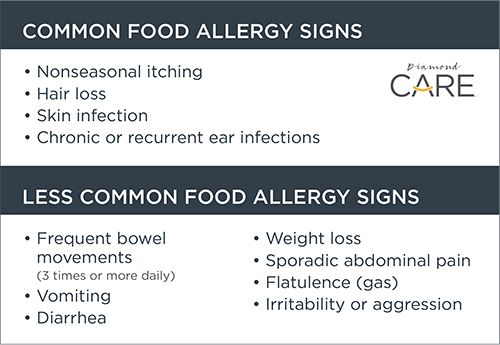 The signs and symptoms of food intolerance mimic those of food allergy, although intolerance can occur after one meal of the offending food. A true food allergy is more likely to make a dog itchy or experience recurrent ear or skin infections. In addition, a true food allergy will often occur suddenly after a dog has been eating the same food for months or years with no problems. Several studies have found that some ingredients are more likely to cause food allergies in dogs than others. Typically, it’s the protein in a dog’s food that triggers an allergy. The most common offenders are beef, dairy products and wheat. Other allergy-triggering ingredients may include lamb, chicken, eggs and soy. Some dogs also may be allergic to preservatives or other food additives. And of the dogs who have food allergies, they may be allergic to more than one thing. The signs and symptoms of food intolerance and food allergy can be similar to many other potential health problems. It’s very important that other problems be identified and treated prior to testing for food allergies. Your veterinarian will be able to determine if your dog’s symptoms are related to food or another, more serious health issue. Be sure to talk with your veterinarian about your concerns, the food you’re feeding and whether your dog might benefit from a change. If your veterinarian agrees with switching your dog’s food, Diamond CARE Sensitive Stomach Formula for Adult Dogs and Diamond CARE Sensitive Skin Formula for Adult Dogs are two new limited-ingredient formulas that may help manage your canine companion’s symptoms. Check out the product information pages to learn more about these foods.